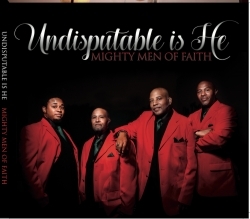 The Mighty Men of Faith have completed their new album, "Undisputable is He," of thirteen Christian and Gospel songs. Union City, CA, February 25, 2019 --(PR.com)-- “Undisputable is He,” a new album by the Mighty Men of Faith set for release on March 26, 2019. N2L records announced today that the Mighty Men of Faith from the San Francisco Bay Area are releasing a new album titled “Undisputable Is He.” The album attests to the undeniable truth that God is "Lord of Lords,” and that He has our back "Everywhere." According to executives at N2L records, the album of thirteen songs contains a combination of Gospel and Christian songs that will encourage and boost the spirit of listeners. Steve Eaton wrote two of the songs, “That's What God Did for Me” and “Everywhere.” Steve has written songs for The Carpenters, Art Garfunkel, and Lee Greenwood. He said, “I tried to be very honest with myself when writing, 'Everywhere' and 'That’s What He Did for Me.' My knowledge of theology and religion is minimal so, I wrote about what I know most about, sin! I wrote these songs through the lens of a sinner. They are about confession and forgiveness." Curtis Hill wrote the song "Now I'm New." Dark places in his past, where he felt there was no light at the end of the tunnel, inspired him to write the song. Curtis says “...accepting God erases the past and that a new life of abundance and love is received.” When the weight of the world feels too heavy to carry, his hope is that the song will encourage others to look toward their faith. Songs that were previously released are also on the album. Woody Woods wrote the song “Because He Loves Me,” a remix of the song from the group’s first album. The Mighty Men of Faith, doing something different, include a Rap song on the Album titled "Show me the Way.” “Show me the Way” asks for God's guidance to navigate the ups and downs of life. “Undisputable is He” is the third studio release by the Mighty Men of Faith. Listen to nine snippets from the album here: https://youtu.be/_mxrB-Sqxyo. For more information email wbasey@sbcglobal.net.